Senior Viktor Svensson returns a serve in a match earlier this season. The men’s tennis team had the top seed in the conference tournament and ranked No. 57 in the country, but knew the Atlantic 10 finals match against defending champion VCU would be the year’s true test. The Colonials had been looking forward to the rematch for a year – since the Rams just held off a storming Colonials comeback attempt last season. But GW kept their emotions in check, even after barely losing the crucial doubles point, and got the revenge they had sought. The Colonials beat VCU, 4-1, and captured the A-10 title for the third time in four years. 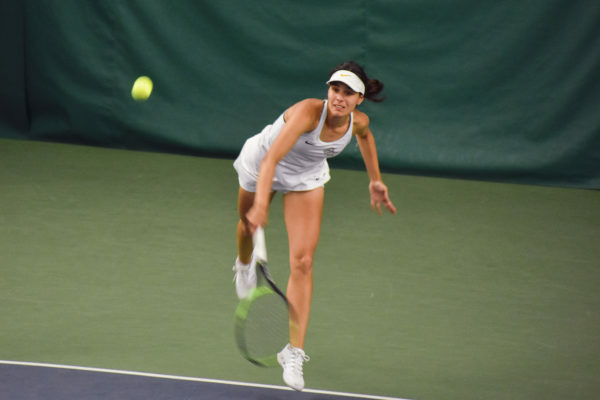 The Rams got out to an early lead in doubles play off the strength of their No. 3 duo, which took down the senior duo of Viktor Svensson and Ulrik Thomsen, 8-4. Down 7-6 and 6-5, respectively, at the No. 1 and No. 2 doubles slots, the Colonials knew they could be moments away from losing the first point of the match. Instead, the squad fought back to extend play with both matches tied, 7-7. In the tiebreakers, the No. 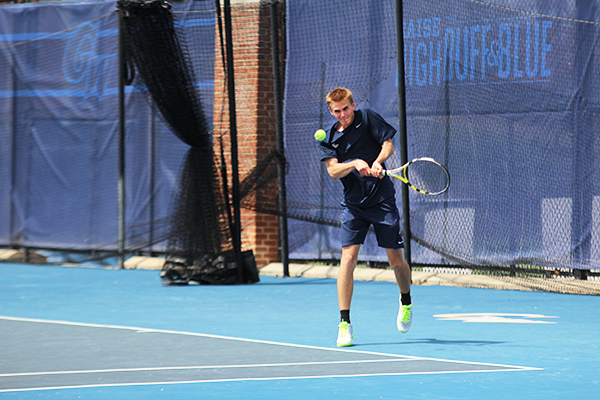 2 duo of sophomore Danil Zelenkov and senior Nikita Fomin won 8-7(6), leaving the doubles point up to the No. 1 matchup of freshman Julius Tverijonas and junior Francisco Dias, who were locked in a tiebreaker at 9-9. The Colonials duo could not finish the surge, and handed VCU the first point of the day. It looked like the title match could become a repeat of last year’s loss. Heading into singles play, GW came out of the break with a jolt of energy, leading on five of the six courts by the end of the first sets. “I just told them [after giving up the doubles point] that they’re playing their best tennis. It didn’t matter. One point is like being down in the first quarter – it’s not much to worry about yet,” Munoz said. Soon after, Dias tied the match 1-1 with an improbable straight sets victory, 6-3, 6-3, against the No. 67 player in the nation, Alexis Heugas. However, just as the momentum swung towards GW in the first sets, the second sets proved to be decisive for the Rams. In the second sets, VCU tied the matches on four courts. With the match now baring an eerie resemblance to last season’s nail-biting loss, the teams headed to the third and final sets with the score deadlocked, 1-1. In quick succession, all the dominoes started falling the Colonials’ way. Zelenkov gave the Colonials their first lead of the day, winning his No. 3 singles match, 6-1, 3-6, 6-4, just before Svensson won his match, 6-2, 6-1, 6-4. Looking for the championship-clinching point, the team turned to its veteran closer: Nikita Fomin. Munoz again knew his team was in the right position: “If there’s anyone we can count on clinching a match, it would be Nikita,” he said. Fomin’s 4-6, 7-6(4), 6-2 victory gave the Colonials another title. 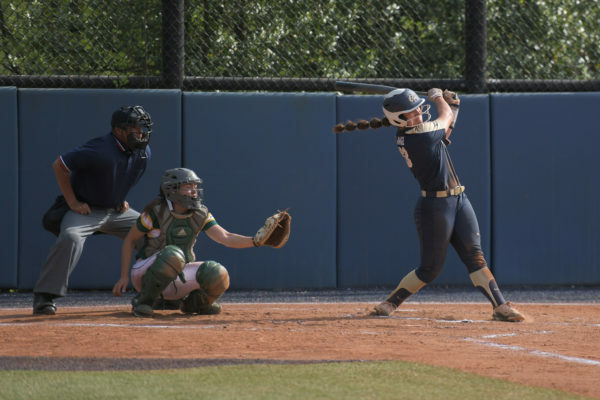 “It feels amazing to have contributed to three of the four titles in GW’s history and to know that you’re leaving a legacy behind,” Svensson said. The team now has three weeks to prepare for the first round of the regionals of the NCAA Tournament, which starts May 9. The Colonials have been to the tournament twice in program history, with each of those appearances resulting in a first-round elimination at the hands of Duke.